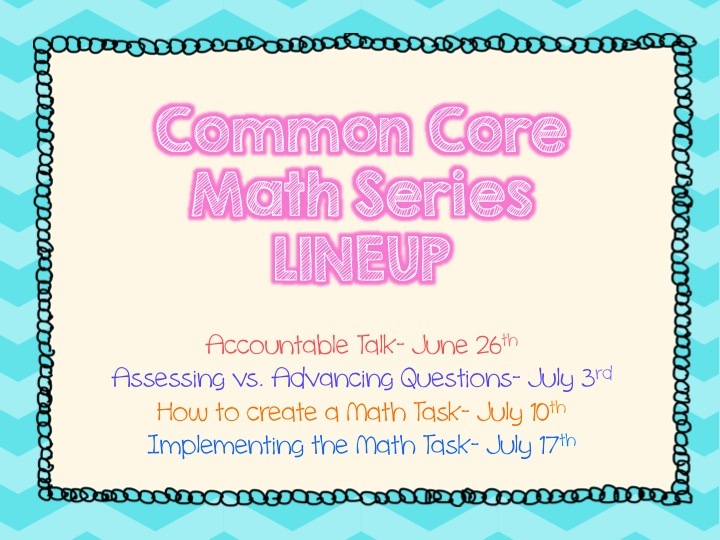 Last week, we talked about what accountable talk is and how it can be used to help strengthen the learning experiences in your classroom. 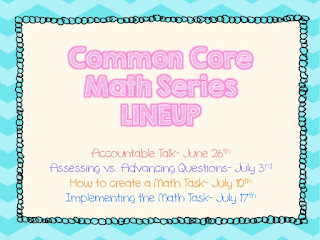 Mostly, accountable talk is to be done by the students when asking each other questions throughout a math task or lesson. However, there is also another very important type of questioning that occurs during a lesson that I think of as teacher based questioning. Now, I am going to be honest with you right away. At the beginning of last year, I thought I was applying my questioning correctly with my kiddos. 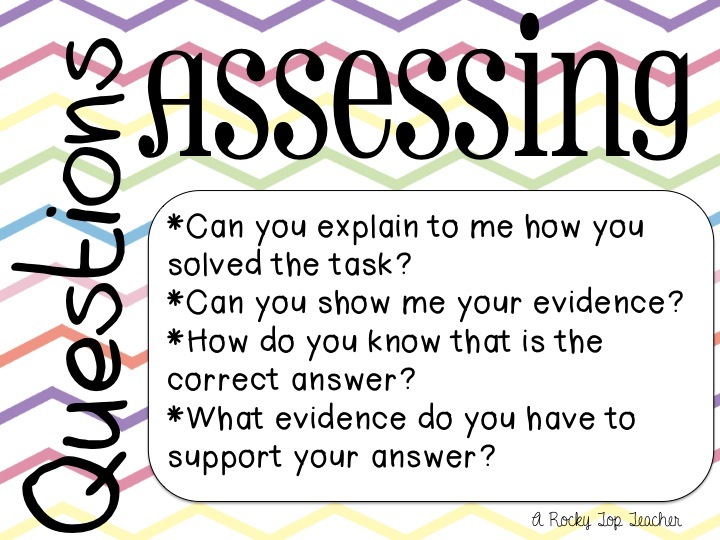 I had a chart on the wall that helped me mentally remember to ask various levels of Blooms' questions throughout a lesson, I planned my questions out ahead of time, and even had cutesy ways to flash them up on the SmartBoard if I needed to. Then, I had to record myself teaching a task for a grad class assignment. And....something awful happened. I realized that my questioning was all wrong. It seemed forced. My questions appeared to be mostly lower level with little rigor involved. And, my questions just didn't always fit. It bothered me. I spent the rest of the year really trying to figure out ways to help with this. Then, I was sitting in this conference last week and BOOM. The presenters talked about assessing and advancing questions, and my little old lightbulb turned on. Thank goodness!!!!!! 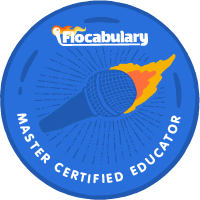 During a task, the teacher should be a facilitator who observes the learning experiences and relationships being built around him/her. 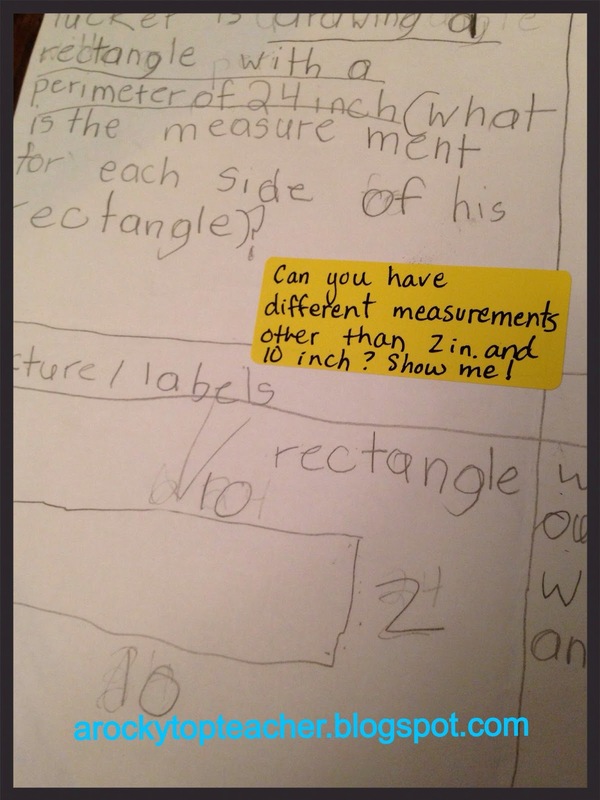 One of the important roles that a teacher plays during a math task is to ask questions to help a student explain his/her answer or challenge the student to take their understanding and apply it further. 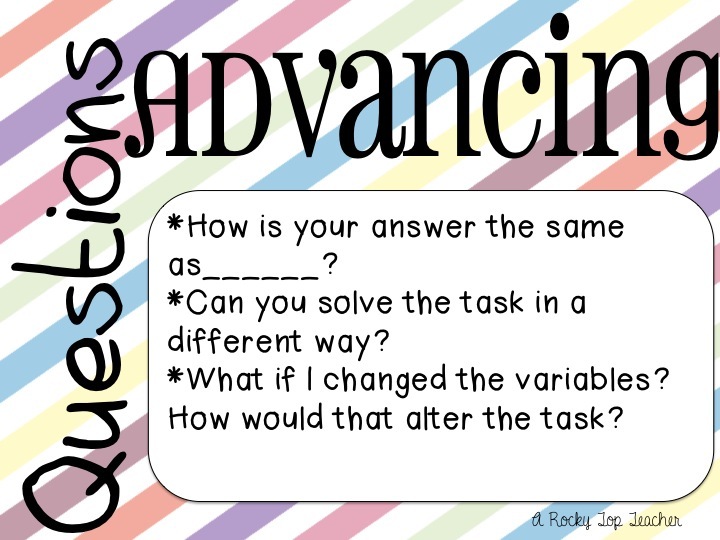 In short, our goal is to either ask a question to "assess" a student's understanding of the math concept at hand or "advance" them by raising the rigor of the task. I know that doesn't seem like a lightbulb worthy concept. 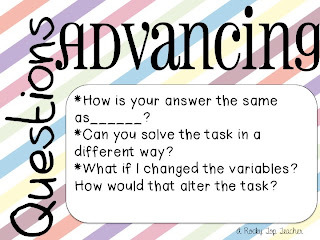 But, when I am talking to a student....I need to determine where they are at in their process with the task at hand. I need to ASSESS their understanding. If they show a firm foundation of understanding...THAT'S GREAT! Now, I need to ADVANCE them. 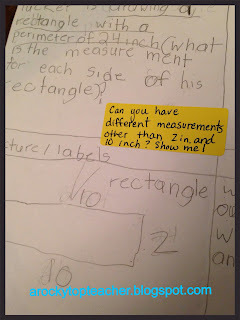 This whole thing also got me thinking about how I could document what I ask the students during a lesson/task. I always have my clipboard in hand and on my clipboard is always a sheet or two of blank labels. You can use them for everything. I am kinda a scatterbrain so when a thought pops into my head or I need to document something...it goes on a label to be stuck in the proper place when I get a chance. 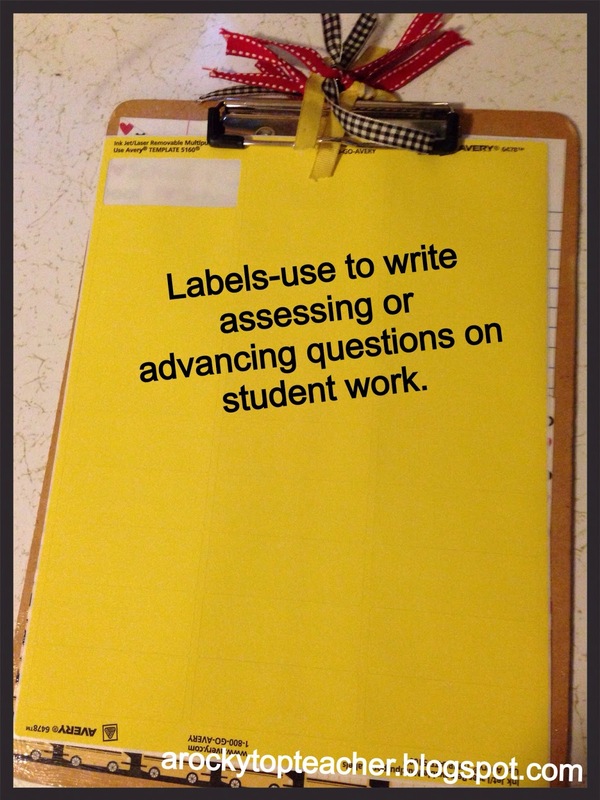 I also use it to write students' notes on and stick on their work. So...why not do that during a task, too? 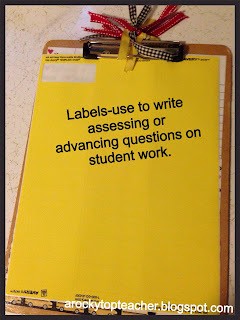 Write an assessing or advancing question down on a blank label and stick it to their papers. 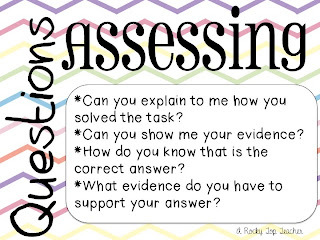 a)It gives the students a visual to refer back to long after you have walked away to go converse with another students b) it gives you a reminder about what types of questions you asked them when you go back to review their student work after a task and c) the parents can get an insight into the task as well by seeing what their child was asked and how it applied to their work. So...there is some food for thought. Did it help you? I hope so! 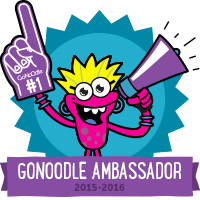 I cannot wait to use this in the fall. Academic feedback and some questioning tips. Yea! 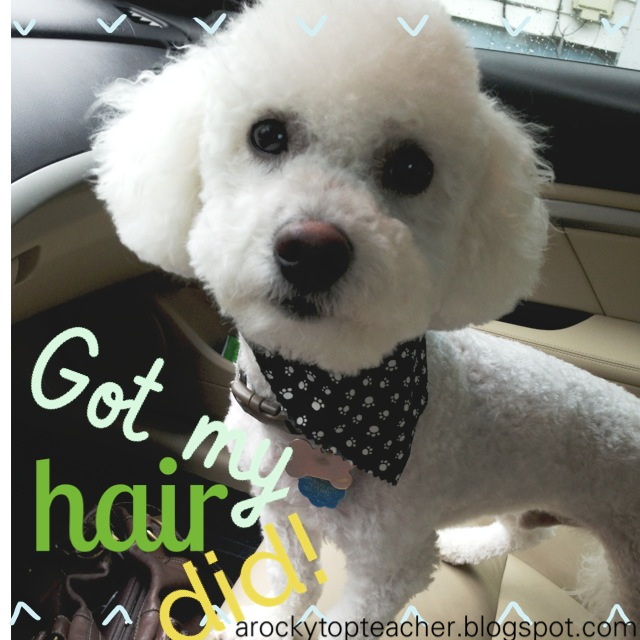 In random news...my furbaby got his hair cut today. 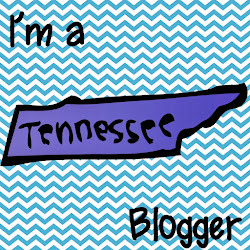 I am headed out of town for a few days so Happy Fourth of July!!!!! Enjoy your summer. You deserve it! I love this! I am definitely taking this to my classroom. Great job! You sure as hell aren't an English teacher.